Hurricane Sandy thrashed New York and New Jersey this past week, wreaking havoc and leaving millions without power and hundreds without homes. You've obviously seen the images of flooded streets and submerged subway stations, boats parked on people's lawns and hundreds of uprooted trees. But, when you hear the first-hand report of people you know left with just about nothing, it hits home harder. For hundreds of Jewish families, this storm isn't just a topic for dinner discussion; it's the challenge of rebuilding their lives from scratch. Why did G-d choose those people at this time to suffer that particular disaster? Nobody can know. But, we are meant to give thought to what response such devastation should elicit from us. The Talmud asks why G-d created a world with have-nots. Why did He make poor people or victims of natural disasters or orphans? Think about it, imagine a world where everyone had what they needed. Imagine a society where every person was self-sufficient. We would have no need for each other. We would be able to comfortably retreat into a bubble of self-interest and never emerge to interact with others. We would never learn the art of compromise or the value of giving. Society would collapse on itself if there was no void for people to fill; no cause for them to contribute to. G-d, the Talmud says, created a system where there will always be those who lack so that we can have the chance to contribute. Hang on, 21st century society actually has become something of an insular place.We don't feel the same craving for human company as our parents did, because we can communicate, get news updates, enjoy entertainment and run our businesses off digital devices. We don't need to talk, because we can text. Personal interaction just get in the way. When the power went down in Manhattan this week, someone posted a telling warning on his Facebook page: "Caution! Lack of power and Internet connectivity may force people to have to confront the uncomfortable experience of communicating with other humans face to face." Sarcastic, but frighteningly true. If there is one thing you have to give the New Yorkers, it's their social agility. Those same brash city-slickers who'll mow you down on the sidewalks on 5th Avenue step up to the plate when their city needs them. They did it following 9/11 or back in the blizzard of '96 (I was there and saw people offering to "shovel your walk" for free) Free busses shuttling people between Brooklyn and Manhattan till the subways come back online or power-sharing (take a look at the hearwarming photo below) are the healthy signs of a society who knows how to band together when its time to give. Twenty years ago, the Rebbe addressed what was a then cutting-edge technological event that linked various global locations in a satellite-conference Chanukah event. 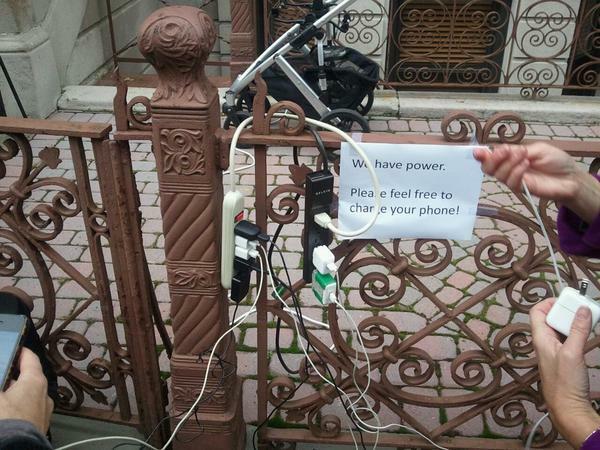 We could also learn something from the New Yorkers. We don't have to wait for disaster to spur us into action, G-d forbid. G-d sends us opportunities to share and give every single day. In our own community, you could help guarantee a minyan for someone saying kadish or you could volunteer to set up the kiddush or simply greet someone you don't know at Shul. Hashem creates need to allow us the opportunity to fill it. And, the cycle that He's made goes something like: "If you fill some of the void in someone else's life and you give to My causes, I'll fill some of the void in yoru life in return." "My relationship with the Rebbe"